It's the start that stops us. Understanding the process and choosing an expert is crucial to the success of your business. ...because you never get a second chance to make a good first impression! Why invest in professional graphic design for your business? Most people know instinctively what bad graphic design looks like. And, just as most people will not tell you that you have an ugly baby, they will avoid telling you that you have ugly marketing materials. Instead, they will not buy from you due to lack of trust or credibility. A professional design is the best investment you'll ever make. It is a powerful, visual communication, and when produced by a professional graphic designer, it is art. Good graphic design is visually pleasing to the eye. It has a sense of balance. Knowing how to effectively position visual elements, like text and images, on the page where the eye is naturally drawn, focuses the readers attention on what is important. When done well, the reader experiences ease and enjoyment as well as an emotional connection to the message. Successful design also has harmony and rhythm that entices readers to remain engaged. Creative use of white space, repetition and proportion provide additional emphasis - if applied appropriately. If not, it's not art. Why hire an experienced, professional graphic designer? Your customers are bombarded with thousands upon thousands of advertising messages every day. An experienced, professional graphic designer knows how to make your message stand out from the crowd. To those who think just because they own a computer that they are a graphic designer, please put down the mouse and back away from the monitor. Remember, just because you can do it, doesn't mean it's the best use of your time. 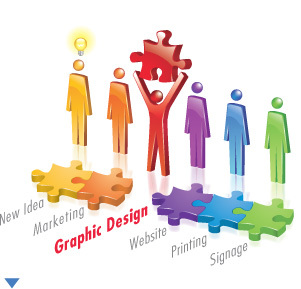 Just as you're an expert in your field, graphic designers are experts in design and marketing. Plus we know which design software to use in order to achieve the best results in the least amount of time. Quality, speed and expertise, all focused on making your business look good. Hiring an experienced graphic designer brings a new perspective and objectivity to your marketing. Business owners tend to be too close to their products/services to effectively capitalize on their strengths. They focus much of their attention on selling to consumers. Whereas designers focus on consumers buying today and again in the future. Why choose a graphic designer that is independent from the printer, web developer or sign company? As an independent graphic designer, I consider the full spectrum of possible future marketing applications, because once an element is designed appropriately for print media, it can easily be shared and incorporated into a website and/or signage to maintain brand consistency. While printers, web developers and sign companies have hourly employees who are capable of using design software to set type and expedite camera-ready files, they are typically focused only on the project in hand and may lack the experience and expertise to produce aesthetically pleasing and compelling marketing designs consistent with your brand and identity strategy. Having an independent graphic designer coordinate all of your files also saves you money, because each file can be prepared and submitted specifically for each intended purpose. For example, the file types and resolution required for printing are different than files required for the web and signage. Providing an inappropriate file in the wrong software could cause delays, missed deadlines or reprinting the entire project. When time is money and money is limited, we guide you though the step-by-step process to ensure that the project is completed on time and within your budget. What types of projects do you specialize in? Each print media project comes with its own set of elements, challenges and messages. I believe that achieving the desired result is a collaborative effort between the designer and you, so let me know how I can fully support you. With over 20 years of design success, I balance professional and creative elements to create compelling visuals that speak powerfully and intuitively to potential new clients, and, in so doing produce captivating first as well as lasting impressions. What types of businesses do you support? I support anyone who has, or needs, a professional image and wants to brand it consistently throughout their printed materials, website and signage to promote their business. Cost is relative to value. An impressive design is worth its weight in gold. When done right, it promotes trust, credibility, and results. The range is based on the complexity of the project, special effects and visual enhancements. Additional charges can be minimized by limiting the number of revisions and providing all necessary content before production begins. ROI can be maximized by also budgeting for photography and copywriting that's not included in the design. Actions speak louder than words, but it's powerful words that inspire people to take action. The best design will not achieve the desired results without great copywritten text. And even though a picture is worth a thousand words, an unacceptable picture is worse than no picture at all. I start in the future by visualizing the finished marketing piece in the hands of the consumer and that person taking actions consistent with your message. I then work backwards through every aspect of the process until every detail and timeline has been considered. And, finally, I launch the software, imagine how the piece will look when it is done and start designing. You start by gathering all of the elements such as, logos, photos, captions, and text. If needed, we can choose images for special effects and background textures from my extensive library of illustrations and stock photography. When you're ready to start, I'm more than happy to help.